I am working on a trip my kids took with my parents last spring break. I didn't want to do a card but struggled with how to revise this Atlantic Hearts Sketch Challenge #149 to make a layout. Finally, I changed the sentiment to the photos and added the title on the bottom as an add-on to the sketch. For this trip I have been using Jackson paper which is retired. 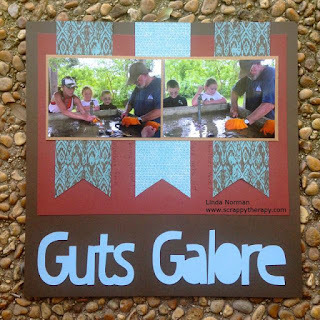 The Guts Galore (the pictures are of gutting fish) title was cut with the Artistry Cricut Cartridge and Design Space to weld it. While this is a simple layout I am really pleased with the final project. 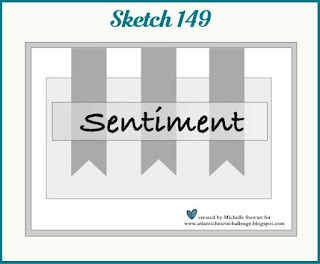 Please join us at Atlantic Hearts Sketch Challenge and share your interpretation of the sketch! Awesome interpretation of the sketch!